Big data. It’s all the rage these days. And not just for tech behemoths like Google, Microsoft, and Amazon. It’s also being used by nonprofits for a myriad of purposes, such as to fundraise and identify populations and geographies where their services can do the most good. Nevertheless, most nonprofits struggle to use big data effectively. Many nonprofits have their own or can otherwise access large outside sources of data (e.g. on donors and potential donors or clients and potential clients) but they lack the capacity to mine it, analyze it, and use it to make better decisions. As a result, they miss an opportunity to further advance their mission. Dads locate father-serving organizations in and near their community that can help them. Father-serving organizations promote their existence to dads in and near their community. Father-serving organizations with information on like-minded organizations with whom they can partner, such as to provide more comprehensive services to dads than they can do alone or to launch a community-wide fatherhood initiative. How is the Fatherhood Program Locator™ an example of big-data use? 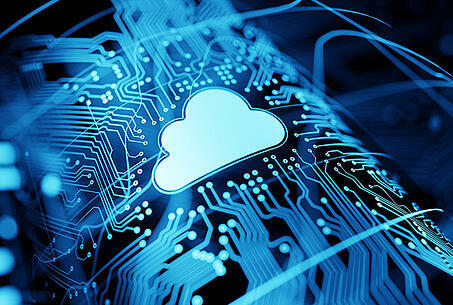 It’s the result of a link between two cloud-based software platforms that we use: Salesforce and MapAnything. Salesforce is used by many for-profits and nonprofits. (Salesforce has a customized platform for nonprofit use.) NFI deployed it in 2014. Whenever an organization acquires an NFI program or other resource for the first time, they’re automatically entered into Salesforce as an NFI partner. In any given month, 40-50% of organizations that acquire our programs and other resources are new NFI partners. MapAnything is used primarily by for-profit sales-driven organizations. It integrates with Salesforce to provide a visual map of customers and prospects. It pulls data from Salesforce on customers’ and prospects’ locations. It helps sales representatives to make decisions, such as the best way to enter a new sales territory and to prioritize current accounts and prospects. It can even help sales representatives to maximize their time in the field by showing traffic patterns so they can identify the fastest and most efficient travel routes. The desire of a dad (or a dad’s loved one) to quickly locate an organization in or near his community that could help him. The desire of a father-serving organization to connect with dads who need help or to connect with other like-minded organizations with whom they could collaborate. The desire of our staff to save time locating the most suitable organization for a dad (e.g. one conveniently located) and to connect father-serving organizations, and the need to be available to do so. 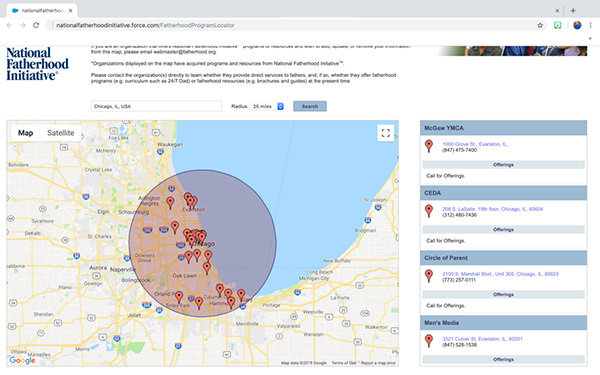 MapAnything pulls location and additional data on NFI’s partners from our Salesforce database to create a map of our partners, anywhere in the country, that are within a 100-mile radius of a dad’s or an organization’s location. The user needs only to enter their city, county, or zip code into the search field. The Fatherhood Program Locator™ shows them exactly where each partner is located on the map and generates a list of those partners to the right side of it. The user simply needs to click a pin on the map to reveal a partner’s address and contact information and to learn whether they have acquired an NFI program or use other NFI resources. The user can print the results of their search and contact an organization(s) accordingly. They get a more comprehensive list than NFI staff could provide. Plus, the Fatherhood Program Locator™ is available 24/7. NFI is committed to the use of big data to further advance our mission. We also use big data to increase the number of father-serving organizations across the country, increase the capacity of current NFI partners to serve dads, and connect private and public funders with organizations they can fund to start and expand father-serving efforts. If so, how has it helped your organization further advance its mission?